A woman participates in a 2016 immigration rally in Chicago. PILSEN — Outraged over President Donald Trump's plan to end a program for young immigrants known as "Dreamers," one Pilsen organization is stepping up to help recipients who might need advice on how to move forward. The Resurrection Project will host DACA Tuesdays in September to provide information on the steps ahead, legal consultations and mental health referrals to recipients of the Deferred Action for Childhood Arrivals work permits. The second of four information sessions will take place at 5:30 p.m. Tuesday at Benito Juarez Academy, 1450 W. Cermak Road. Following sessions will be Sept. 19 at La Casa, 1815 S. Paulina St., and Sept. 26 at Back of the Yards College Prep, 2111 W. 47th St.
"Dreamers are opening businesses, creating jobs, buying homes, buying cars and paying taxes," the Resurrection Project said in a statement. "These nearly 800,000 Dreamers are not just contributing significantly to the social fabric of these United States, but also to its economy." Chicago officials and immigrants advocates have rallied against Trump's decision since it was announced last week. Ald. Roberto Maldonado (26th) called the move a "clear racist act," and Mayor Rahm Emanuel has repeatedly tried to reassure students in the program they have nothing to fear living in the city. About 600 immigrants and refugees have gotten legal help from a $1.3 million legal defense fund set up by the city in January. The fund also paid to train 300 "community navigators" who educated 11,000 immigrants "to make sure they know and understand their legal rights," according to a statement from the mayor's office. 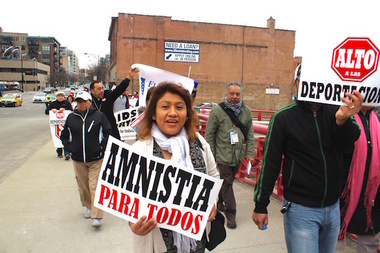 About 150,000 Chicago area residents do not have status as legal permanent residents, and tens of thousands more are worried about their immigration status, according to the National Immigrant Justice Center, one of the groups working with the city on immigration issues. Current DACA program participants will be allowed to continue working until their permits expire. Those whose permits expire by March 5, 2018, will be permitted to apply for two-year renewals as long as they do so by Oct. 5, officials said. That would give Congress six months to enshrine the program into law before deportations would be allowed to start, officials said. The Resurrection Project began in 1990 as six churches in Pilsen pooled resources to address crime and economic troubles in the neighborhood. In its 27 years, the organization has branched out to leverage more than $469 million in community reinvestment through offering 844 units of affordable homes for ownership, rental housing, health and education and small business assistance.